are “Pure Michigan,” including cream, sugar, maple sugar and more. Sara Murdick sure knew her way around a kitchen, there’s no doubt about that. After arriving in the United States from Germany in the 1800s, Sara and her family eventually opened a confectionery in southeast Michigan, and then in additional locations in northern Michigan before opening a candy shop on Mackinac Island in 1887.All the while, Sara continued to perfect her old-fashioned fudge recipe. Today that original Mackinac Island fudge recipe still features her precise mix of all-natural ingredients, which blend to create a unique, mouthwatering sensation that now comes in many flavors. In addition to a perfect recipe, the art of fudge making also plays an important role in creating the textured, traditional, old-fashioned fudge that Original Murdick’s Fudge customers have come to love. Generation after generation, our fudge makers are required to learn the secrets of producing perfect fudge.Each batch starts in a copper kettle and is painstakingly created with attention to indoor, outdoor and marble countertop temperatures, and length of time/temperature required for cooking, boiling, stirring, cooling and shaping. The art of fudge making at Murdick’s also requires skilled professionals to perform a specific and timely turn-of-the-wrist “paddling” technique when shaping the delectable fudge into loaves. Blend a tried-and-true recipe with handcrafted, precise techniques — along with a temperate Great Lakes climate — and you get pure excellence. To satisfy your sweet tooth, order our 23 Mackinac Island fudge flavors from our online store here. Select a box of our handmade old-fashioned fudge, brittle, caramel corn or toffee. 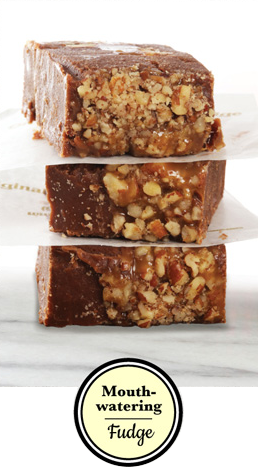 Our fudge contains all-natural ingredients with no artificial preservatives. The best way to enjoy and store it is at room temperature. We make and ship our fudge fresh. Those who prefer to enjoy their fudge at a future time can preserve it in the freezer for up to six months. • When ready to enjoy, remove from freezer, allow it to sit at room temperature to a consistency you prefer, and enjoy!